From the 5 days that I’ve been here marching and protesting thus far, this chant hits me the hardest. I’ve been tear gassed 3 times, chased by an armored SWAT vehicle, and have had to hide under my steering wheel to avoid detection, in Ferguson, MO. And on the first night that officers patrolled the entire area on foot, when they stormed the crowd, I ran with my hands high, thinking that I could be taking my final steps. I’ll never forget running past the police, fighting back tears, with my hands as high as possible, afraid of my country. Even the press wear helmets in Ferguson. There is nothing romantic about these protests, about this moment in America. Ferguson is a grieving community currently processing its pain, disappointment, anger, and request for justice in front of the world. As a kid, I remember the nights we slept on the floor because the gunshots were so close to the house and it was less likely that a bullet would go through a floorboard than a window or wall. I became a teacher because I wanted to make sure that kids in communities like mine had the skills and opportunities to follow their dreams. I wanted to show my students that they, too, could master math skills and content and love it. But I also want them to be alive. Kids deserve to walk down the street and feel free, feel like they have ownership of their bodies and the spaces in which they live. As the child of a recovered and recovering drug addicts, it is important to me that life circumstances don’t limit kids’ understanding of what is possible in their life and their world. But you have to be alive to learn. A key part of being college and career ready for many black boys is simply remaining alive until then. Mike Brown was just about to start college when he took his final breaths. In this moment, we have an opportunity to be honest about how black bodies are policed in America. We have an opportunity to begin to be critical friends of the structures and systems that are the bedrock of our democracy. I have to admit, in the 5 days that I’ve been here, this does not feel like an America that I know. I have never seen so many police in one place, let alone with rifles, in armored vehicles, and armed with smoke bombs, flash bombs, LRAD, and tear gas. And we have to be honest about why the police are here. This town is afraid of a black community that is expressing its pain and anger with an unjust system. The structures in Missouri do not yet understand that anger is not synonymous with aggression. And that some will exploit anger, but some are not all. Anger is a normal and healthy emotion that we feel when we think that we have been wronged. Imagine a community that is experiencing this around the same event, at the same time, in front of the world. But the response to seeing anger manifest when it is in black communities cannot be the National Guard, as it is in Ferguson. We have to change systems and structures that attempt to police and manage black bodies to the point that freedom becomes purely conceptual, an imaginative framework attached to democracy. The events of Ferguson are the culmination of experiences that a community has had when it feels that it has not been seen or heard as equals. 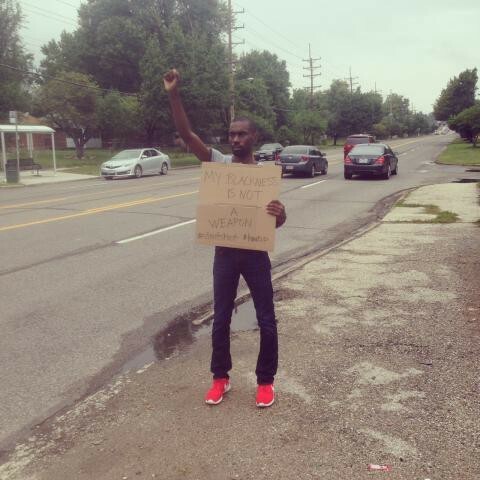 Y’all, this is principled protesting in Ferguson. Even the most militant protestors will tell you that they are enraged at how Mike Brown’s body laid on the ground for hours while his parents grieved. They will tell you that Mike Brown’s limp body deserved an ambulance and not the back of a SUV. They will tell you that they are tired of marching, tired of being herded like animals in their own streets. And they are tired of voyeurs to their pain. Here, in Ferguson, this community is looking for allies. This community is looking for people who are willing to assist in changing structural inequity in the name of social justice. And, simply, allies who fundamentally believe that black lives matter. Since the beginning of the protests, I have carried a sign that reads, “My blackness is not a weapon.” This community wants blackness to be understood as complex, worthy, powerful, imaginative and gifted — just like all other races. We are all in this community. We are Ferguson, too. Each night that I go to protest, I am afraid. But I believe in justice. And I am my brother’s keeper. A native of Baltimore, DeRay McKesson is a graduate of Bowdoin College and began his career as a 6th grade math teacher in New York City as a member of the 2007 Teach For America corps. As a teenager, he worked as a community organizer, training youth and adults to work together to overcome community challenges with Baltimore’s Safe and Sound Campaign. He has also worked for the Harlem Children’s Zone, opened an academic enrichment center for middle grades in West Baltimore, served on grant-making boards, and has worked for TNTP. The majority of his career, however, has been working for school systems, leading Human Capital initiatives. He was previously the Special Assistant in the Office of Human Capital with Baltimore City Public Schools for 3 years and is currently the Senior Director of Human Capital with Minneapolis Public Schools. He works to ensure that structures and systems support all kids and that only the most talented and able adults work with and support our schools and students.